Soldiers on an amphibious assault vehicle communicate during military exercises at the Zuoying naval base in southern Taiwan, Jan. 18, 2017. Singapore and Taiwan will continue to carry out a military training program begun in 1975, Taiwan officials said this week. Singapore’s apparent decision this week to sustain a more than 40-year-old military training program with Taiwan, despite pressure from China, is giving Taiwan’s embattled foreign policy a rare win in Asia. Officials in Taipei said this week Singapore would continue the Project Starlight military training program despite a visit last month to China by the Southeast Asian country’s Prime Minister Lee Hsien Loong. China sees self-ruled Taiwan as part of its own territory and discourages other governments from pursuing diplomatic or military relationships. The two sides started the training program in 1975 under Singapore’s founding Prime Minister Lee Kuan Yew and his friend Chiang Ching-kuo, Taiwan’s premier at the time. Chiang went on to become president. Singapore picked Taiwan for the training site because the city-state lacked land for extensive military exercises, including war simulations. A soldier runs to an M109 tank during military exercises at the Chukeng area in Taichung county, Taiwan, Jan. 17, 2017. 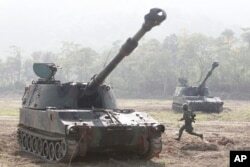 Singapore and Taiwan will continue to carry out a military training program begun in 1975. Singapore can balance China against Taiwan, an act most countries do not try, because Beijing officials want good relations with the country that some in Beijing see as a model for governance: a wealthy, services-dependent economy that’s largely ethnic Chinese, effectively run by a single political party. Scholars believe Singapore has assured China that its military training with Taiwan will not lead to formal state relations. “This kind of issue has been raised repeatedly by Beijing, and I think the Singaporean government in the past also made it clear that they’re still holding official relations with China,” said Andrew Yang, secretary-general of the Chinese Council, Advanced Policy Studies think tank, Taiwan. The training project offers Taiwan mutual trust with a modern Southeast Asian country as well as regular military exchanges, Yang said. Eventually those ties may allow for naval ports of call and growth in private visits, he said. “That is a kind of reinforcement for the armed forces in Taiwan, that they still maintain unique ties with Singapore and still maintain mutual trust,” Yang said. In 2013, Singapore and Taiwan signed a free trade deal that was good for exporters but a source of worry for China as it was a formal agreement. Taiwan is Singapore’s sixth largest trading partner. China has used its economic clout since the 1970s to win over diplomatic allies from Taiwan, leaving the island just 20 worldwide — and none in Asia — compared with more than the 170 countries that recognize Beijing. China asks its allies to regard democratic Taiwan as part of Chinese territory. Possibly to pressure Singapore, the Chinese territory of Hong Kong delayed shipments of nine armored vehicles to Singapore for two months last year. The military vehicles had reached Hong Kong on their way home from a training event in Taiwan. Some news reports in Singapore speculated that the prime minister’s otherwise conciliatory visit to Beijing last month would prompt a temporary cancellation of military training in Taiwan. But Taiwan Foreign Minister David Lee said he had learned that the program would go on as usual. Training normally takes place whenever Singapore sees a need and reaches out to Taiwan. “According to information from Singapore, everything is normal,” Lee told a Taiwan parliament session Monday. But, he added that it was “not convenient for me to elaborate on the specific content” of Taiwan’s recent information from the Southeast Asian state. Singapore’s Ministry of Foreign Affairs did not reply Friday to a request for comment. The Singaporean prime minister also made no obvious pro-Beijing statements about Taiwan on his visit to China, said Chiu Chui-cheng, spokesman for the Taiwan government’s Mainland Affairs Council. Some foreign heads of state use their travels to Beijing to swear support for the host’s view that Taiwan belongs under Chinese control. “According to this council’s checks of Singapore’s government and Singapore media reports, this time Prime Minister Lee Hsien Loong apparently neither said right out nor verbally indicated support for one-China or opposition to Taiwan independence,” Chiu said. 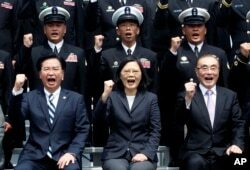 FILE - Taiwan's President Tsai Ing-wen, center, along with Defense Minister Feng Shih-kuan, right, and Secretary-General of National Security Council Joseph Wu, left, cheer with navy officers during a visit to Zuoying Naval base in Kaohsiung, southern Taiwan. China itself may avoid pressing Singapore too hard on Taiwan, Liu said. A thinning of relations with Singapore, if due to China, would anger the Taiwanese, many of whom already resent Chinese pressure on their government’s foreign relations. That resentment helped install Taiwan President Tsai Ing-wen last year. She disputes Beijing’s dialogue precondition that both sides belong under one flag, but China hopes talks can improve seven decades of stormy relations with Taiwan and further its goal of unifying the two sides.